1000G on Her Majesty's Spiffing. How is that by the way? Have had some vague interest in it. It's not too bad, very short but pretty funny point and click game, loads of references to other games and movies and stuff. 1000G on both Baseball Riot and N.E.R.O. 1000G on Duke Nukem 3D 20th Anniversary. Nice, I've got this and Far Cry 3 installed, how long did they take? Thanks! Can't be sure on exact time, I didn't go straight through on either. But found SR IV to be a bit easier to get through, despite the "Fourth and Forty" achievement asking to play the game for 40+ hrs. Helped out that Re-Elected has all the DLC included, which were a breeze to gather some GS. Far Cry 3 was a bit more of a chore to complete, specifically some of the collectible relics. I put it off at first and then forgot all about it until recently. 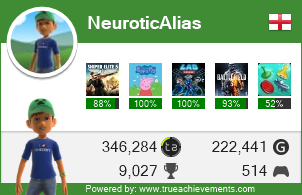 [TA's] definitely to credit for some of these achievements for sure. 1000 G Dear Esther. Without a doubt, most boring game ever! Had to play through that dross 3 times as I missed one directors commentary! The first walking simulator, I managed to find all the director commentaries on the first go but missed one of the memories first time around so had to start again, luckily it was on the first level. I agree. First play through didn’t know what was meant to happen. But once I put the directors comments on the story made sense. Still boring as f*ck though!